There are plenty of strange alternative uses for herbs. Rosemary, for instance, is supposed to soothe the skin and cure dandruff—though I can't promise how well it will do either. Science, however, now tells us it definitely can make you smarter. To work that out, subjects were asked to complete numerical reasoning tests before and after being exposed to the scent of rosemary oil. 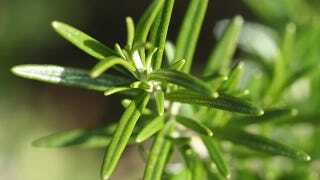 The researchers then measured the levels of 1, 8-cineole, the main chemical constituent in rosemary's oil, after the experiments and compared it to the test scores. The higher the levels of 1, 8-cineole, the higher the score test. The research is reported in Therapeutic Advances in Psychopharmacology.